ORLANDO, KITCHEN & BATH INDUSTRY SHOW (January 10, 2017) ― American Standard, DXV and GROHE, the kitchen and bath brands that comprise LIXIL Americas, are unveiling new kitchen and bath innovations here today that improve health, increase sustainability, and enhance the quality of everyday life. 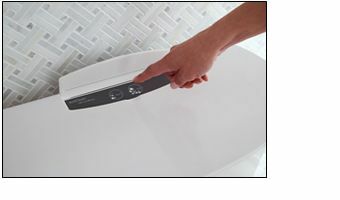 The key product highlights, outlined below, include a new self-cleaning toilet, a kitchen faucet with a unique hands-free foot control, and a luxury smart bidet toilet loaded with lavish, technologically-advanced features. “We are pleased to once again showcase the aligned synergies and innovations of the American Standard, DXV, and GROHE brands at KBIS. These iconic plumbing leaders – operating under the LIXIL Americas division – represent sophisticated, inspirational design for consumers, combined with exceptional performance and inventive technologies that continue to raise the standard in the kitchen and bath industry,” said Steven Delarge, CEO and president of LIXIL Americas. The stylish and affordable American Standard ActiClean toilet combines the power of the exclusive VorMax flushing technology – which delivers the cleanest flush ever engineered – with an integrated, user-activated self-cleaning system. Simply press a button, walk away, and let the toilet do the rest – it’s that easy. 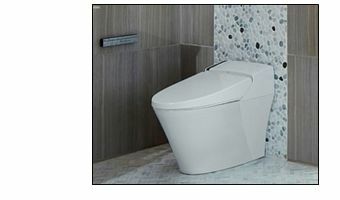 The DXV SpaLet AT200 luxury smart toilet offers technologically advanced conveniences such as hands-free flushing, automated lid opening and closing, and heated seat. This state-of-the-art fixture delivers the ultimate in comfort and performance with a completely adjustable two-nozzle water-spray system with integrated air dryer. The innovative, easy-to-use and immensely practical GROHE Foot Control Technology allows users to switch the water flow on and off with a tap of the foot on an activation plate installed discreetly in the toe space of the kitchen cabinet. This innovative enhancement frees hands for added maneuverability and helps to reduce the spread of germs and bacteria around the kitchen. LIXIL Americas is the exclusive sponsor of the 2017 KBIS Innovative Showroom Awards. A winner will be chosen from each of five categories, with one chosen as the overall Innovative Retail Showroom. The winners will be announced today at 3:15 p.m. at the KBISNeXT stage in the South Hall at the Orlando Convention Center. Awards will be presented by Brian Pagel, vice president, kitchen and bath group, Emerald Expositions, and Michael Donehey, national showroom director, LIXIL Americas. LIXIL Americas is also the exclusive decorative plumbing sponsor of Modenus BlogTour, which is bringing 24 design bloggers and social media influencers to KBIS. In addition, Modenus X Design Milk Social Lounge – a casual space where social media influencers, influential designers and sponsoring brands can connect and learn from each other – is being sponsored by LIXIL Americas. For more information on the products featured at KBIS, visit American Standard, DXV and GROHE to download the brands’ KBIS 2017 Press Kit materials. DXV is a portfolio of luxury bath and kitchen products that celebrates the distinguished 140-plus-year heritage of American Standard. DXV reimagines the most influential design movements during that time: Classic (1890-1920), Golden Era (1920-1950), Modern (1950-1990), and Contemporary (1990-Present). DXV is part of LIXIL, a global leader in housing and building materials products and services. The DXV Showroom at Flatiron is open to explore our luxury products and collections. Learn more at www.dxv.com, or follow us at facebook.com/dxv, twitter.com/DXV, youtube.com/DXVLuxury, pinterest.com/dxv, instagram.com/dxvluxury. Learn more at www.grohe.com/us, or follow us at facebook.com/groheUS, twitter.com/grohe_US, youtube.com/user/GroheAmerica, instagram.com/grohe_us/. AT200®, ActiClean®, SpaLet® and VorMax® are registered trademarks of American Standard Brands. Modenus™ is a trademark of Modenus, LLC. Design Milk® is a registered trademark of JD2 Media.